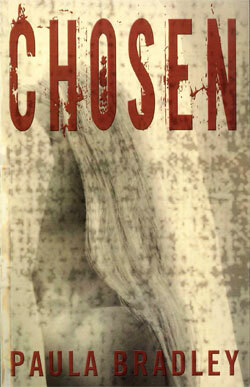 Scavenger Hunt for Chosen plus Giveaway! I am hosting a stop on the fun scavenger hunt for Chosen by Paula Bradley. Please also visit Review from Here. When Mariah Adele Carpenter attempted to end her own life with a handful of pills, she thought she had left the cares of the world behind. Somehow, her act of self-destruction became one of redemption when a mysterious figure healed her – and set her on a journey that would test her faith, her perceptions and ultimately her sanity in Paula Bradley’s heart-pounding debut novel CHOSEN (Fiction Studio, 2011). "Heat immediately spread through her body, accompanied by such serenity that Mariah briefly thought the pills had done their job, and, somehow, she was in heaven. But it was quite the opposite: she felt more alive than ever. Unconsciously, she straightened he legs, every muscle, every tendon, every bone relaxing as her mind began to register a myriad of other sensations." Fill out the form below by July 30th for a chance to win one of two copies of Chosen. You must live in the United States or Canada. Winners will be notified by email.